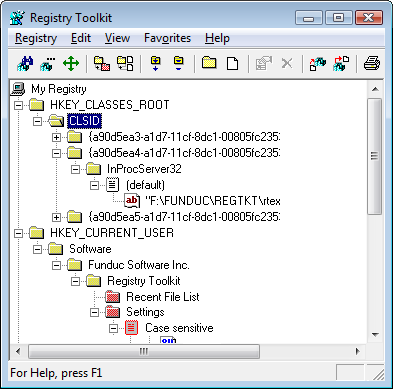 Registry Toolkit performs search &/or replacement operations on the Windows Vista, Windows 7, Windows 8, & Windows 10 registry (32-bit and x64). The program now is unicode capable. You can search/replace in registry data, values, keys (or any combination) and specify the types of data to process. A browse function lets you can scroll through the registry to select a starting point for your search/replace. You can create and edit keys, values, & data, delete keys & values (after confirmation), and undo the last changes made. Output functions let you preview the changes that would be made by a replace in advance of actually making the replace. Replace preview can also be set up to let you interactively select specific replaces to be made in advance of the operation. This same possible is available for the undo function - you can reverse all or some of the last change made. Regular expression search/replace using a grep-like syntax is possible - no other utility does this. The program can also use DOS environment variables in search/replaces. You can import and export .reg files. The import function has a registry comparison preview that shows existing vs. new data. You can adjust what is displayed in the preview and eliminate some items from the operation before merging the data. A unique 'Operations' function can be used to copy, move, export (or delete) selected values to another location in the registry or a .reg file. Script & command line functions are available for automated &/or complex operations. Registry Toolkit will operate on a remote registry (if you have permission to do so). A print (w/ preview) function lets you print the display. Confirmation prompts for replaces can be turned off. Searches can be case sensitive or not. A progress meter keeps you informed during long operations. Mail, Fax,& Phone Orders are available. SETUPRT.EXE (1.2 MB) - Self-installing version for 32-bit Windows. See Install & Uninstall Information for guidance about installation and removal. Download this to a temporary directory and run 'setuprt.exe' to install. SETUPTR64.EXE (1.3 MB) - Self-installing version for 32-bit Windows. See Install & Uninstall Information for guidance about installation and removal. Download this to a temporary directory and run 'setuprt64.exe' to install. Also see Registry Toolkit Merge - Companion program that can creates self-merging .reg files.